A general understanding of the different technologies that make up the Internet of Things. Ideas for how these technologies can be used in libraries. An overview of the current state of voice computing and its role in the Internet of Things. 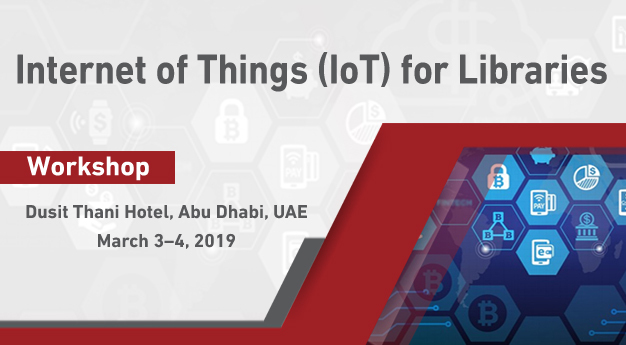 The workshop will be moderated by an expert, and published author of books and research papers, on emerging Internet of Things technology and its impact on libraries. Senior-level managers, and heads of libraries (including deans, directors, chief librarians, and deputies). Researchers in the Library Information Science LIS field. Dusit Thani Hotel, Abu Dhabi, UAE. Does not include SLA–AGC conference registration fees. Registrants will be responsible for their own accommodation, visa and flight tickets. Share it; Let your colleagues know the good news! Registration will be open until February 27, 2019. Places are limited. Early registration and payment guarantee your seat.